Jeff has to tutor Brett to pass English so Brett can keep his quarterback position on the High School varsity squad. The tutoring sessions help Jeff come out of his shell and reveal hidden depths to Brett. And the friendship between Jeff and Brett grows into first love. 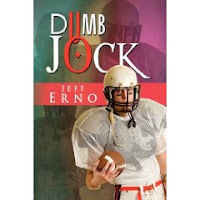 "Dumb Jock" is a work of passion that Jeff self-published through print-on-demand company Xlibiris. Add your review of "Dumb Jock" in comments!